When we heard Trinity Lutheran Church was going to be torn down just shy of its 100th birthday, Brother Mark and I did our best to document the building. Here are photos of what I think was the most impressive part of the church: the chancel and altar with its statue of Jesus. I’ll run more pictures later. It seems an odd coincidence that the old building was discovered to be structurally unsound not long after a large donation was made to the church that could only be used to build a new structure. Missourian photographer Fred Lynch has a series of photos showing the steeple being pulled down that makes the place look pretty sturdy to me. I was baptized in that church, confirmed in that church, suffered through a multitude of Christmas pageants in that church, and my father’s casket stood in the shadow of that altar. I made a promise to myself never to set foot in the new building. I have no respect for an organization that allows nearly 100 years of memories to be turned into brick dust. It is no longer my church. I ran a post about the church’s bell in 2011. I read somewhere that the bell had been moved to the new church. Here are photos taken from the bell tower in 1978. I copied a 1954 pledge drive booklet that included an extraordinary photo of the congregation. It’s amazing how many faces I can still pick out of it (names, however, are another matter). Brother Mark is holding Son Matt up for a closer look. He doesn’t look too comfortable. I think he may have heard that story about God telling Abraham to sacrifice his son on an altar and he’s not sure if the story had a good ending. It wasn’t just a rumor that the donation was earmarked for a new building. A relative of the donors confirmed it. Jesus wasn’t welcome in the new church: he has been exiled to Hanover School. I’ll swing by to see him on my trip back to Cape in October. I’m ashamed to say it was my great aunt and uncle who made that stipulation in their will. I loved the old building and never felt like “new” Trinity Lutheran was my church, either. What a beautiful chancel and alter. I have recently been in the new church a couple of times with Tom and his Mother and the new church chancel and alter can’t “hold a candle” to what is pictured here. 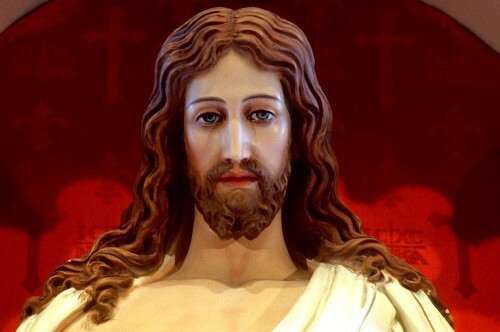 Did they destroy the statue of Jesus? I don’t remember seeing it in the new church… maybe I didn’t pay attention.. Hopefully they gave it to another church… How sad.. Seems more and more old buildings are going by the wayside. Thank goodness we have photos and memories…Thanks for the info and pics Ken. I just added an update to the story (you might have to press Ctrl-F5 to see it). Apparently Jesus wasn’t welcome in the new church. He has been exiled to Hanover School. Well just another old building destroyed. Big deal, it’s not like it was important or historic like the old hand ball courts…. Hey wait a minute, they destroyed it too! Do I sense a pattern here? Or is it okay to pitch out the old when it gets in the way or when someone pays you to do it. I am sure the people giving money to build a new new church were well meaning and good people. Perhaps, just perhaps, the old building could have been saved and and new one built to better serve the Church. I’m just sayin’. I guess if I want to see Jesus in Cape I will have to go to Hanover School. I wonder where Elvis is in Cape? I attended this church as a child and a young woman. I was married in front of that Magnificently Beautiful Statue of Jesus. Your photos have put tears in my eyes! It is heart breaking! As a young child I attended The Lutheran church in Tilsit Mo. That is where I was Baptized as an infant. 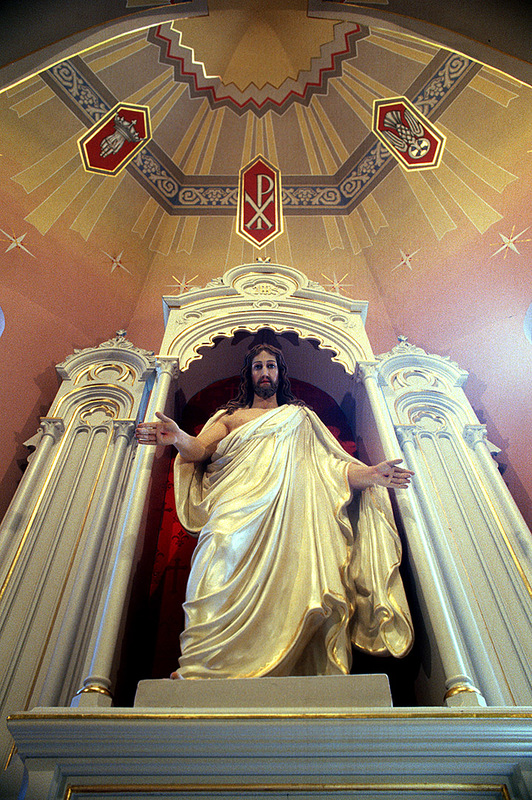 I remember the Altar and statue of Jesus as being, if not similar, identical to the one in Tilsit. I would appreciate any information anyone would have in regards to this. Thank You So Much for recording the Beauty of something that holds so many memories for my family and me. I feel the same way. I grew up in the Old Trinity but have never set foot in the new building. As you commented, it’s not my church. I am so sorry to learn that the old Trinity church was torn down and the incredibly beautiful altar was not kept for the new church. I was baptized and confirmed in that church, sang in the choir, etc. 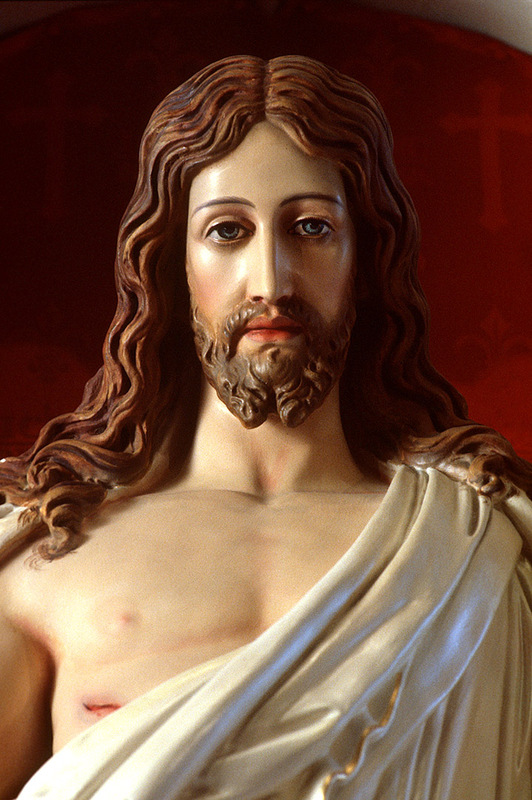 I always thought that altar and the statue of Jesus was the most beautiful I could ever imagine. I also loved the stained glass windows. What a shame! Love having a copy of these pictures of the inside and outside of Trinity Lutheran Church as I was confirmed and married there in 1961! I’ll never forget the first time that I stepped inside Trinity- thought I had died and gone to Heaven! It was JUST AWESOME WITH THAT BEAUTIFUL ALTER WITH THE LIFE-SIZED STATUE OF CHRIST WITH OUT-STRETCHED, WELCOMING ARMS. AND THE SUNSHINE RAYS THAT SHOWN THROUGH THE STAINED GLASS WINDOWS REALLY ADDED THAT “HEAVENLY TOUCH”. No kidding- It just took my breath away! And to be there with the young boy I loved- I felt soooo blessed! 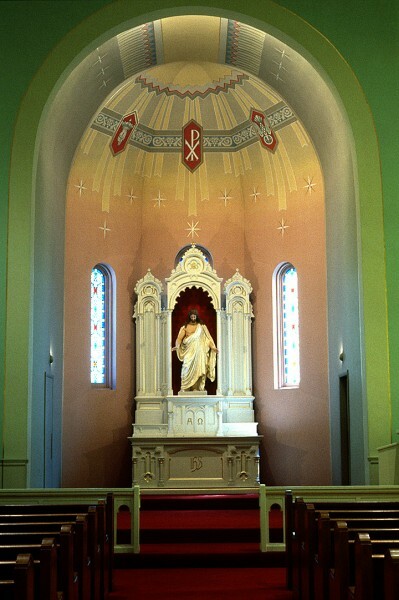 I had previously tried to find pictures of Trinity Lutheran Church for the family biography that I am writing for our grandchildren and couldn’t, so it is wonderful to have these. Thank you, Ken. I always look forward to seeing what you’ve dug up for us each week. 1) One Sunday in December 1977, a group of congregation members were standing on the sidewalk talking after worship service as many of us did. They just happened to be pretty much in line with the north wall. One of the men just happened to look up to the east and noticed a significant bow in the top of the wall at the roof line. He commented to the others that it didn’t look right. The men started a conversation with other members about what they saw and someone with some construction knowledge suggested that the congregation should get an engineer involved. This led to an overall inspection of the structure, especially the roof and exterior walls. 2) The engineering report (I had the opportunity to read it) explained that the structure was built with brick and mortar, however the mortar contained no cement, strictly lime and sand. It also stated that the upper chords of the roof trusses were not properly tied together with a chord at the bottom, which allowed the roof peak to sag and placed outward stress on the top of the side walls. Since the mortar contained no cement, it allowed separation and movement in the brick layers resulting in the bow of the walls. Overall, the structure was headed for a roof collapse as well as the side walls. 3) As I recall, estimates to repair the structure were over $1 million. The decision about what to do was made by the congregation voter’s assembly. The fact that money in excess of $1 million was left for new construction but could not be used for repairs ultimately sealed the old structures fate, combined with what could be built in its place. It is a shame that the old structure had the issues it did and ultimately monetary considerations drove the decision about what to do. The decision-making process was painful since no one really wanted to tear down the landmark; it was near and dear to everyone’s heart as is evidenced here. It was truly beautiful, yet simple, however the congregation saw an opportunity to build anew with existing funds and expand the ministry in the process. With all due respect to the engineering report – and I don’t claim to BE an engineer – but that method of lime and sand construction was common at that time. There are many a building in Cape Girardeau and St. Louis that are still standing tall and strong nearly two centuries later. I’ve had a general contractor who specialized in that kind of restoration tell me that it could have been done. If the accounts I’ve heard and the photos Fred Lynch has posted are any indication, the old building was a long way from falling down. It took a lot of effort to convince it it was time to go. But, let’s put the building aside. 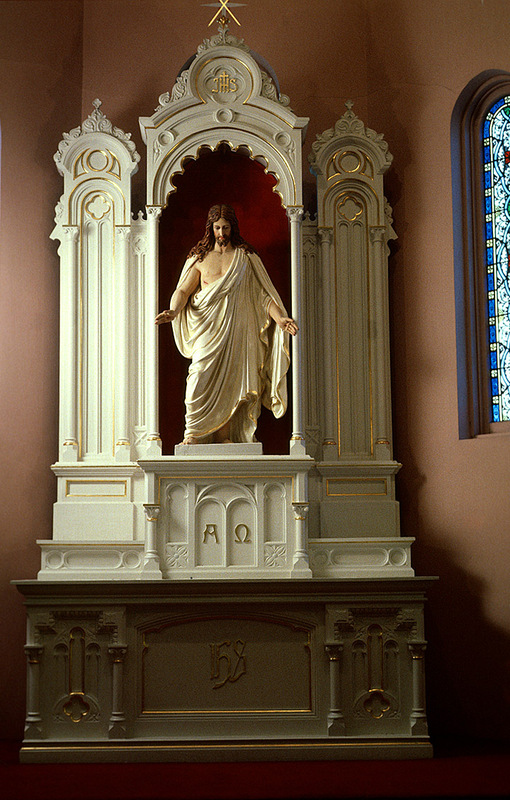 What’s the reason there was no place in the new church for Jesus and the altar? Was He “structurally unsound” or infested with termites? Surely it wouldn’t have hurt to have SOME trace of the old place brought over. I too was sorely disappointed to find that the chancel area was not reproduced in the new church. The chancel, as illustrated by Jeffry’s remarks, was very moving. The craftsmanship and beauty in the original altar in no way was approached by anything that appeared in the new sanctuary. Additionally, I feel that the rest of the new sanctuary also does not even approach the beauty of the original, the sides and the rear wall. When people use that “God told me to do it” defense today, we jail them or lock them in mental institutions. Would it have been responsible for a congregation to worship in a church that had been declared structurally unsound by trained engineers? How many people do you think would feel comfortable worshipping in a building that was declared unsafe? 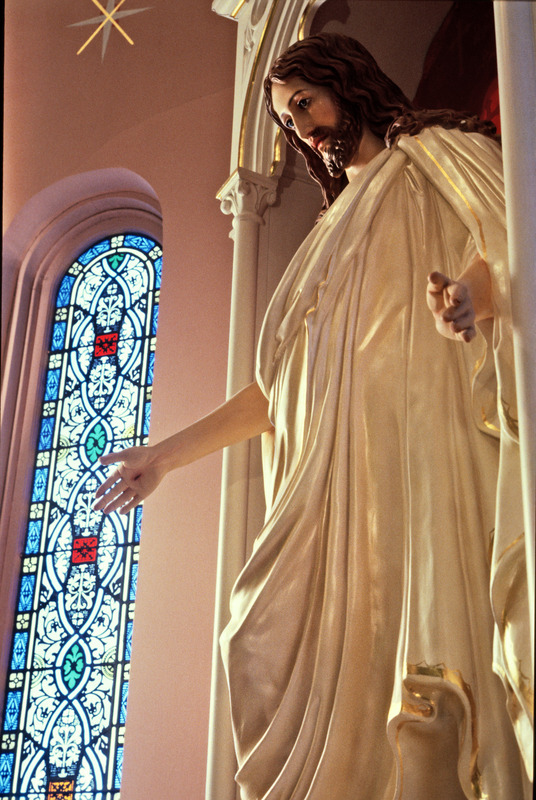 A statue of Jesus has been carved by Mr. Birk, a member of our congregation and stands in our chapel. A church is not about the building but the message inside. I hope someday you can become less bitter about this. 1. I am bitter when landmarks are destroyed or allowed to deteriorate rather than being preserved. Victories like Schultz School (now Schultz Senior Apartments) are few and far between. Of course, the congregation had an obligation to make sure it was worshiping in as safe a building as possible. I’m also cynical enough to know that if you have a large pot of money available that can only be used for building a new structure, it’s awfully tempting to find reasons to tap it rather than preserving a community treasure. I’ve read (and written) enough bid specs to know that you can almost always find a way to justify the conclusion you want to reach. I wonder how much the new building project was a solution looking for a problem. That was the point when I realized I didn’t need stained glass windows, golden chalices, booming pipe organs and elaborate statuary to worship. The old building carried the spirits of a vital German community that had gathered in there for nearly a century for events both joyous and sad: of weddings, baptisms, funerals, pageants and confirmation ceremonies. Look at the families in the fund-raising publication I posted. Generations of those families sat in those pews, many of them probably in the same place week after week. There was a community of continuity. Count me sad and disappointed, not bitter. Ken, I, too, have many beautiful memories of Old Trinity Church. However, it was no longer structurally sound and had to be replaced. I was asked to serve on the New Church Planning and Building Committee and was committee secretary for all 5 years from the planning stages through its dedication in 1982. As Judy Peetz commented, a building does not make a church…the members do, with the Lord’s blessing. Please rest assured that as much as could be was incorporated into the new church so that it is a blend of the old and the new. Examples are the original organ, the bell, stained glass windows, etc. I would invite you to go there with your mother, and I think you’ll see some of the old with the new. It’s beautiful, and the Lord continues to bless the church’s mission. Our pastors and the congregation are awesome! Thanks for the invitation, but I’ll opt out. 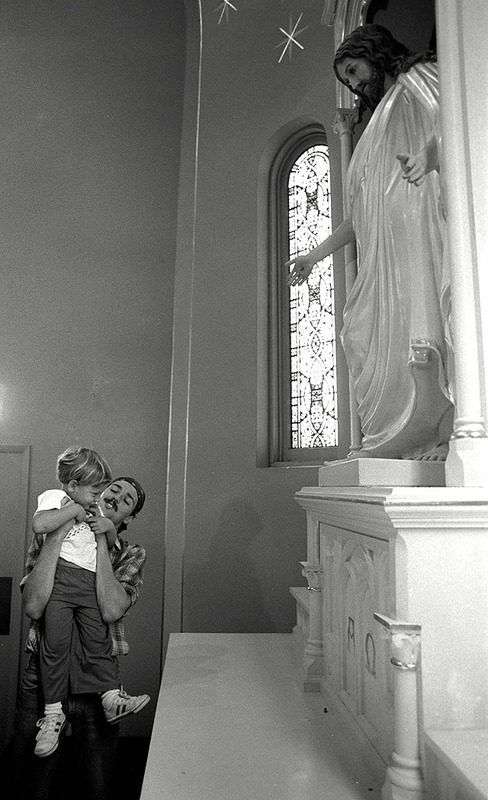 I think Dad’s funeral in 1977 was the last time I was in the church (except to shoot these documentary photos). I prefer to remember it as it was. The new building has no meaning for me. One of the reasons I spend so much time shooting old and abandoned buildings is that I feel a kinship with the spirits that move in them. I don’t get those vibes from New Trinity. And, to clarify, I don’t see ghosts, but I feel something and I try to convey those feelings. I thought this altar with Jesus was located in the old Hanover School which is like a museum. I was baptised in this lovely old church. I remember the alter vividly. I also remember the pipes for the organ in the balcony at the back of the church. And I remember sadly as we stood on the sidewalk across the street watching it be torn down.